D.nnr ;rpne! | Who Says Penguins Can't Fly? I’ve wanted to convert to Dvorak, or rather the Swedish version Svorak, for a while. But it seemed too troublesome, and soon I forgot about it. Until recently, that is. I read a review of ergonomic keyboards, and Typematrix EZ-Reach 2030 was one of the products reviewed. 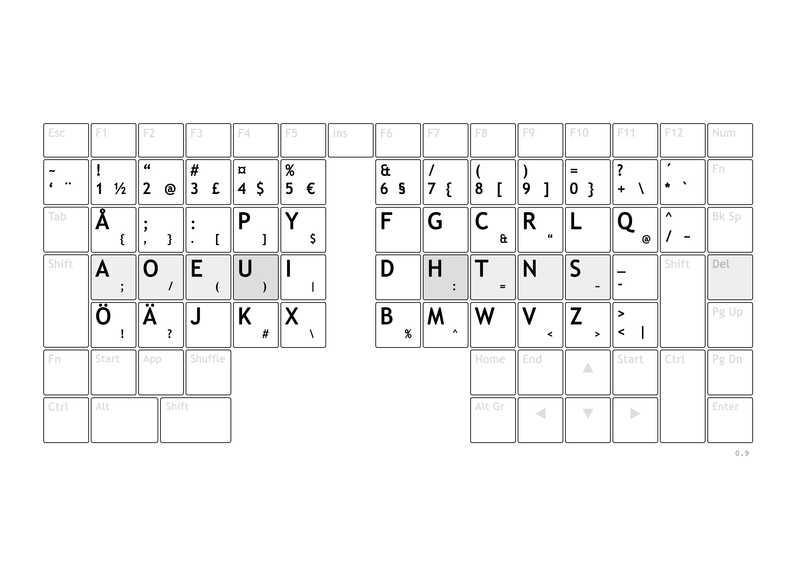 I had seen that keyboard before, and even if it didn’t score very good in the test (they didn’t like the grid layout. Huh?) the geek in me just screamed: I want it! I recalled that a friend of mine used a Typematrix, so I asked him about it on IRC. As it’s quite expensive here in Sweden, I wanted to know where he had ordered it. Short story even shorter, here I sit with my EZ-Reach and try to type Svorak. ‘You can have mine’ the friend told me, “I don’t use it anyway.” Just like that. The C key didn’t work, and some keys were a bit hard to press, so I decided to clean it inside out. It took some time to assemble it again, much thanks to the Space key. Nice to see someone is using this keyboard still! I just orderd one of eBay for $20. Sweet. $20? That’s an awesome deal. I’m currently waiting for the USB model. Believe it or not, but it’s going to rock even more. Please write a follow up to this post! How is it? Which OS are you using it with? Ah, sure. Since then I’ve upgraded to the new TypeMatrix 2030 USB. My OS of choice is currently Arch Linux. You can find a (somewhat out-of-date) picture of my custom layout, which I call “chvorak”, here. I can write more about it and the keyboard when I find some time, hopefully later this week. Update January 26, 2010: My weekend was busier than I thought, but now I’ve started to write the article. I think there’s a spelling mistake in the title, it should be “D.nnr <rpne! ", as it currently translates to "Hello zorld!"